Legge House was built in 1865 as the village school and served with distinction for many years. Bristol Diocese closed the Victorian built “Top” School in 1965 when Wroughton had a large new housing estate built; this included new schools in the village which meant the old school was no longer needed and an alternative use had to be found for the building. Local youngsters worked hard with other interested individuals to raise funds and an accommodation unit was added, which was built with dormitories to accommodate 30 and included the Manager’s flat above. The school became a residential youth centre in 1967, named after Miss Legge who was a major donor. Legge House has been welcoming youth groups and schools to stay ever since! The aims of the centre are to promote educational, social and spiritual values, while providing quality time together. Corporate conferences have always subsidised the running of the centre, while being able to benefit from the uniqueness of the venue. 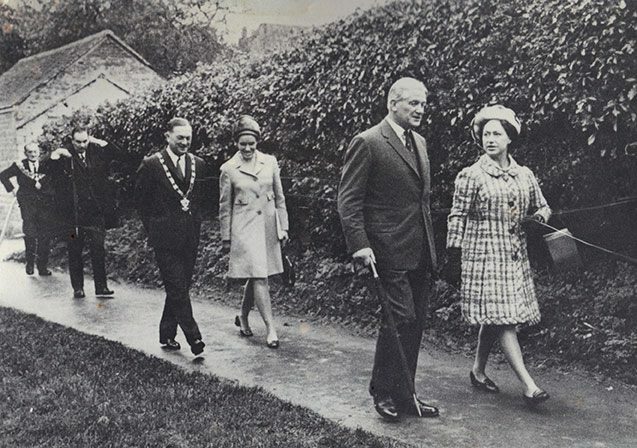 Legge House received its first residential group in January 1967, became registered as a Charity in July 1967 and was formally opened by HRH Princess Margaret, who performed the official opening after the building work was finished, in October 1968. In January 1968 the first caretaker/manager was paid 5 shillings per hour (25p in modern money), which is the equivalent of £3.98 per hour today! In the 21st Century the Manager’s flat became extra accommodation, the resident teacher’s original accommodation having been converted to a conference room in the late 1960's. Today, Legge House provides a lot of flexibility in its use both for day visitors and residential groups. Family occasions such as wedding receptions and funeral wakes are also held at Legge House. On Sunday 25th June 2017 we formally celebrated the 50 years of 'Making quality time possible'. 150 people joined The Lord Lieutenant of Wiltshire: Sarah Rose Troughton, The Mayor Of Swindon Councilor Maureen Penny, The Bishop of Swindon The Reverend Dr Lee Rayfield, Robert Buckland MP and officials of the Wroughton Youth Adventure Charity past and present. Apart from a brief rain shower it was a pleasant and enjoyable afternoon with music provided by the Wroughton Silver Band. It was a lovely atmosphere of love, success and joy. We were all young once, but Legge House gives people of all ages the chance to come and have an ADVENTURE and to be away from home, sometimes for the first time. CHARITY. To all the kind people who run this place and to all the volunteers - I thank you and congratulate you, and I trust you are very proud of all you do to make Legge House such a legendary place. How do you quantify the benefit of children spending quality time away from their parents? Character building; Independence; Friendship; Broadening Horizons; Learning to cope as individuals with the problems that life throws at them. These benefits cannot be measured as mere statistics as the payback lasts well into the life of the individual and can be seen in the growth and transformation of the child into a well-rounded adult. A service that Legge House still endeavours to provide both today and in to the future. Please help us to ensure the long term future of Legge House.